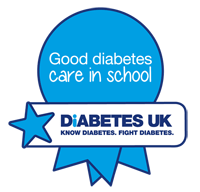 Congratulations to the Good Diabetes Care in School Award holders in Scotland, Diabetes UK officially recognises that these schools deliver effective diabetes care and management. View the winning schools in Scotland below, and view the national winners by going to ourhonour wall. They have taken on the responsibility of my child’s insulin pump meaning they have to undertake more training. They have helped my son gain lots of confidence and feel just like every other boy in his school. They work with the family and the child and include them in the care given at school. They have helped build the child's confidence and are very good at making him feel included and that his diabetes does not have to prevent him from taking part in activities. The school have embraced the teaching, given to them by us as parents and the diabetes nurses, nothing has been too much trouble for them. My son had never been excluded from school activities and has had many overnight residential trips to France and Switzerland. There have been a number of meetings and education groups in which a number of staff and parents always attend. Parents and pupils feel well supported by all staff in the school. The school have us 100% support when our son was diagnosed. Their willingness to support our son has taken a massive load off our shoulders, this was a gift. He has never been left out and feels he can participate in all activities on offer. If the school are unsure, they give me a call by that rarely happens which is a testament to the amazing care. The school provides a high standard if care, support and supervision on a daily basis. They appear to get the balance just right. At training sessions staff have been caring, motivated and committed to providing good and safe diabetes care. I have always had positive feedback from parents about the level of care. As a mother of two children with Type 1 diabetes, the school have gone out of its way to educate themselves about the condition, to ensure my children are fully supported and included in all aspects of school. The school has embraced education and support when a student with diabetes required insulin by injection at lunchtimes. The school again embraced the education and support when the student began using an insulin pump. The student is included and supported in all aspects of school life. The care my daughter receives at the school is excellent. Mrs Connor knows the children with diabetes well and she goes out of her way to help. The school demonstrates exceptional care for all its students with Type 1 diabetes. However I believe the school has gone the extra mile due to one particular member of staff. The school has whole-heartedly embraces the unique circumstances diabetes brings. The school has always been keen to ensure as many members of staff as possible are trained to help out. Our daughter is never excluded from school trips. They are very proactive in relation to Diabetes education and will request that staff get regular updates to ensure their training needs are being met. Communication is the best thing. I am completely confident that my child is properly cared for each day at school, as well as during extra curricular activities. This peace of mind makes a huge difference to us as a family. The school has a very proactive approach towards supporting children with diabetes. They encourage as many staff as possible to attend diabetes training.